This PCL-18B mobile column lift system comes in a set of 4. When combined, the system lifts up to 72,000 lbs. Ideal for two-axle vehicles. Sets of 2, 6 and 8 are also available. 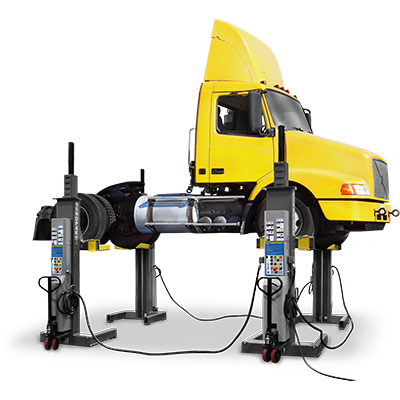 With a full set of mobile column lifts, you'll lift vehicles up to 72,000 lbs. This weight class encompasses most heavy-duty and commercial semi-trucks. If you need more lifting power, upgrade to a set of 6 or double your capability with a set of 8. For a frame-engaging adapter, check out the PCL-18B cross beam. This handy tool allows you to safely remove tires and perform full wheel service on your vehicle. Interested in the PCL-18B (Set of 4)?